(Text automatically translated) Splendid villa located in prime location, 300 mt. From the square in Castromarina 100 mt. From the beach "La Source", a central but on a rocky promontory from which dominates the town of Castro and the sea front. Exceptional view. The building is on two floors: downstairs bedroom with a full bath, bed and kitchen corner, on the upper floor are the living room, the dining room, kitchen, large bathroom, a double bedroom, a twin bedroom and extra bed in the dining room. The villa is equipped with all comforts and accessory for an ideal stay, including satellite TV (with SKY), washing machine and air conditioning in the rooms. The house is surrounded by a large park landscaped with flower essences typical of the Salento on the three terraces overlooking and a small pine forest on retro.Nel park there are 2 outdoor showers, one with hot water. The property is available for any needs of guests, the price includes the work of park maintenance and technical support for any immediate repairs carried out by qualified engineers, as well as the bed linen (sheets and towels) and the consumption of water, electricity and gas (first cylinder). 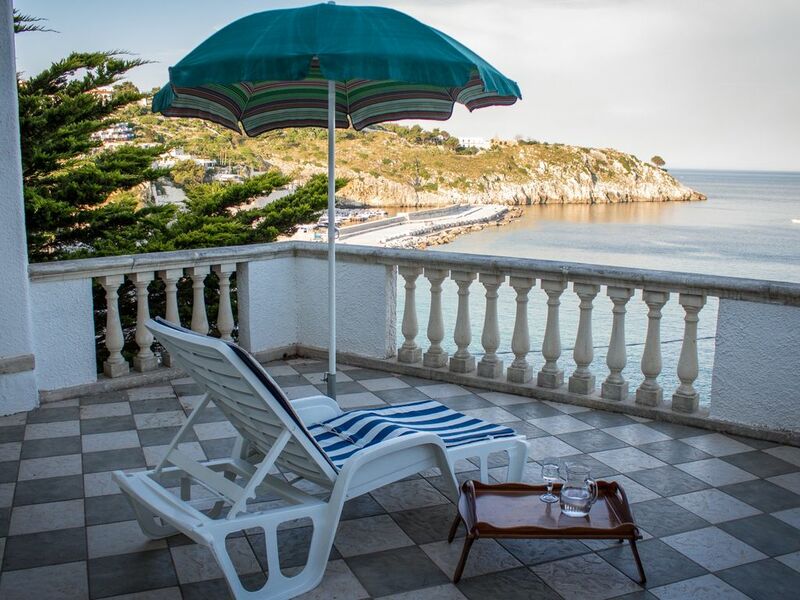 Nice house with a wonderful garden and a outstanding view to the sea and Castro marina. Giulio very helpful and service friendly. We felt at home immediately on arriving in Castro and Villa Rizzo. Giulio was at hand to help with everything. The views from the terraces are fantastic. The sea was steps away for swimming. The local restaurants nearby particularly La Pizzica were friendly and served lovely food. The small shop at the end of the road was also brilliant for everyday essentials. Overall, having visited other towns we knew why Castro is the Pearl of Salento.Villa Rizzo is full of charm and a perfect place to relax. Thank you for everything Giulio. We spent a week in this beautiful house and had a great time. The terrace is wonderful with a great view over the incredibly turquoise and clear water. It is really nice that the house is positioned high up so that you have the view. The location is overall really good. It is very close to some nice cliffs for swimming, and also just a couple of minutes walk down to the harbor. The house itself is also very well laid out and nicely decorated with everything we needed. With the warm weather in Puglia it was also nice to have a small terrace on the backside of the house to have some shadow during the hottest hours. Giulio was very helpful and friendly. Everything around our staying worked smoothly. We hope to be able to come back! Toll ausgestattet, nahe Badeplätze, Klimaanlage in den Schlafzimmern ... da bleiben keine Wünsche offen. Der Vermieter ist bei Fragen immer telefonisch erreichbar, sehr freundlich und hilfsbereit. Im Hochsommer reichlich viel Beschallung mit Musik aus dem Hafen. Wenig Weingläser im Haus. Das tut dem Gesamteindruck aber kaum Abbruch. Una splendida villa forse anche più bella che nella foto , una vista mozzafiato . Grazie! Sono contento per voi! (Text automatically translated) From Bari motorway exit "Bari Nord" follow the direction Brindisi-Lecce, take the highway up to Lecce, Lecce, take exit "1" tangential direction EAST to Jerseys-leuca, take the highway x Jerseys, jerseys continue to come to Leuca and exit at exit "Poggiardo, Castro", then follow the direction Poggiardo Castro. Tariffe scontate in relazione alla durata, Proprietario non presente in loco . Concordare preventivamente l'orario del check-in. Preferibilmente tra le 16 e le 20.